Don and Loretta Gibbs left Davis last week for a two-year mission in Beijing. He will be the head of the University of California Education Abroad Program at Peking University and she will be an unofficial UC ambassador. Electronic mail will help them keep in touch with their friends in Davis, I hope. I know they will have many stories to tell about the changes taking place in China, both political and social. Loretta lent me a copy of "Coming Home Crazy" by Bill Holm (Milkweed Editions, Minneapolis, 1990), a collection of essays by an American who spent a year, 1986-87, teaching in the Chinese city of Xi'an. Don and Loretta, fluent in Chinese, have made many trips to China. Loretta was born in China and raised in Taiwan. Compared to red-headed, bearded, 6-foot-5 Holm of Minnesota, who arrived in China weighing more than 240 pounds (and less when he left), the Gibbses will be able to move through Beijing very nearly invisibly. They won't experience the same clashes in culture that made Holm's adventures so hilarious and frustrating. Still, they loved Holm's stories and wanted me to read the book in preparation for what I hope will be my own trip to China in the not-too-far-distant future. "It's funny, I laughed all the way through it," said Loretta. "He's a good writer and interestingly most of this best stories are about the hard times he had," she added. If you're taking a trip to China, bring a Swiss Army knife with lots of attachments. You'll find it handy for myriad emergencies whether you want to fix a lamp, silence a loudspeaker, open a can or a bottle. Holm also found it necessary to unscrew a hinge so he could escape from a stuck elevator. After reading this chapter, Don said he was tempted to bring along a large tool box. Be very, very patient. The Chinese bureaucracy has been refined over the course of 6,000 years and has managed to create a web of red tape so intricate that it cannot be penetrated. For instance, after his first two days in China, Holm had collected a half-pound of ticket stubs in his billfold. He got his first ticket when the Chinese airline lost his luggage. He got tickets in restaurants in order to order food in the same restaurant. Another dish required another ticket. He bought tickets to enter the Beijing zoo and more tickets inside the zoo to look at the exhibits. He entered a store to buy a postcard but first had to buy a ticket. And of course the bus required a ticket as did the public outhouse. Bring an appetite. Specifically, bring an appetite for dumplings of pork and seasoned vegetables encased in dough, boiled or fried, eaten with dark vinegar and hot red pepper oil. Holm describes the best restaurant in Xi'an, a dumpling house called the Polite Person's Dumpling Parlor, where the common people eat downstairs (after buying a ticket) and the foreigners eat upstairs (no ticket required). Holm says he ate plain dumplings downstairs and fancy dumpling upstairs and loved them both. Be warned. The title, "Coming Home Crazy," refers to culture shock. Holm had it bad after spending a year in China. Don and Loretta probably will suffer only mild cases upon their return. But a neophyte traveler could pick up a bad case of culture shock in a relatively short time. Poverty, over-crowding, strong, strange odors, a culture that emphasizes the group rather than the individual all these things can lead to disorientation quickly. Some foreigners never adapt to China while others take to it quickly, only to find themselves in a state of shock and abhorrence when they come home to face the material world of America. The trick is to develop an appreciation of both cultures. Balance the good and bad. "Like every Barbarian (foreigner) in China for the last thousand years, I complain a lot," writes Holm. "Dirt, spitting, smelly squat toilets, rude bureaucracy, overcrowding, noise, bad wiring, worse plumbing, nasty store clerks, appalling safety, broken-down machines, cold gray cement buildings, grim apartments, no hot water, no clean air, drab clothes, dust, garlic pickles, greasy meat, surly service, and on and on and on." So begins a chapter that switches tone immediately to contrast the daily life of Chinese adults to the safe haven enjoyed by Chinese children in state-run kindergartens. "The room smelled and looked simply and unostentatiously clean, gay, practical, affectionate, cared for. The machines worked, the paint was fresh, the simple details of safety and comfort and been tended to. This was a civilized room, full of love and intelligence...this was done for the children." 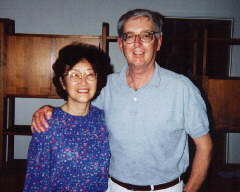 Lorretta and Don Gibbs in Davis, June 1995, shortly before leaving for Beijing. "Coming Home Crazy describes adventures in China;" this corresponding PRINTED MATTER review ran in the Davis (Calif.) Enterprise on June 25, 1995.